The balls are carefully aligned along a horizontal line, just touching. 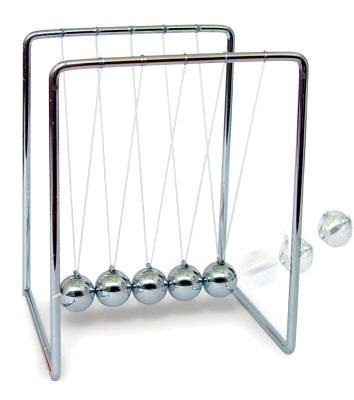 When the ball on one end is pulled aside and allowed to swing as a pendulum, it hits the next ball. But the outcome is fascinating, the one ball on the far end is knocked away from the others with the same speed as the first ball had initially and all of the other balls remain nearly at rest. If you pull back two balls and let them strike the others, two balls are knocked from the other end, and all the other balls remain nearly at rest.